Whether you're a seasoned Blog Hopper or a brand new blogger that needs assistance from the getgo, you've come to the right place. We have answers and information here for all of you. If you do not find the answers to your questions on this page, feel free to contact any member of our team: Doreen at DoggiesandStuff@gmail.com, Carrie at AllThingsDogBlog@gmail.com, Paris at Editors@Dogtipper.com or Diane at Diane@ToDogWithLove.com. Here's some tips I've gathered on taking pics of your furry friends and their favorite products. Natural light always gives the best results. Consider a contrasting background to your subject's color and texture. Watch for unwanted objects in the background. Reposition your pet for a pleasant and contrasting background, without distractions. Have some fun with themed items for your photo set--any other related props you may have available. Enjoy the experience! Shoot with primary lighting behind you, whether indoors or out. Moving subjects generally blur in photos. Set your shutter speed accordingly. Use a photo editing program to remove red-eye; however generally you get your best pics when using little editing, and more pre-planning of your subject and background. Flash photography often produces green-eye in pets. This is tough to fix, so shoot for pics that don't have your pet looking directly into the camera, if flash is required. Candid shots are often best for pets that don't pose well. Try shooting with your flash off, using a night setting, and see if you get better results. Use a squeaky toy or treat to get your dog to look in a certain direction. If you have a black pet, try a close up shot and natural light. Experiment with your macro setting for close ups. Close ups and portrait shots will display best in the Blog Hop's thumbnail photos. Check out our Updated Badge! Fido's Freebie Friday's original host, All Things Dog Blog, has a growing partnership. Having added Doggie's and Stuff early on, we now have two additional co-hosts, Dogtipper and To Dog With Love. To make it easy for you to add the badge you want, we're offering you three versions to pick from. Please include one of the badges in your post or sidebar. We appreciate links to your hosts. What exactly makes this a blog hop? I do not understand. Can you spell out the rules for posts that are acceptable on this hop? How do I put the Fido's Freebie Friday blog hop badge into my post or on my site? Can you help me sign up for the blog hop? How do I make the links or thumbnail images show up on my own blog? Why does the hop open on Thursday afternoon, if it is called a Friday blog hop? What can you tell me about the legalities of running giveaways? 1. What exactly makes this a "Blog Hop"? "A blog hop is a linky list that is SHARED ON MULTIPLE BLOGS. Blog readers see the same list on each blog, and can "HOP" from blog to blog seeing the same list of links to follow: BLOG HOP!" 2. Can you spell out the rules for posts that are acceptable on this hop? Any giveaway or event with prizes from a family friendly site that involves a pet-related, or pet-themed product or service as a prize. Pet-lover prizes or giveaways that are pet-related or pet-themed are also acceptable. For example, a handbag with a dog embroidered on it would be acceptable, as would a wall decoration saying "I love my dog". Sites linking up must be family friendly, i.e. Rated G for Good Doggie, or maybe P.G. for Pretty Good Doggie. Keep it clean! Prizes and giveaways may stem from contests on your site such as photo contests or scavenger hunts or questions that readers must find answers to, as long as the site is family friendly and the prize is pet-related. Drawings, sweepstakes, raffles, etc. that award a pet-related prize are acceptable, when linked from a family friendly site. If you wish to share our rules on your own site, feel free to copy them from All Things Dog Blog's Fido's Freebie Friday post. The rules will be posted there each week. 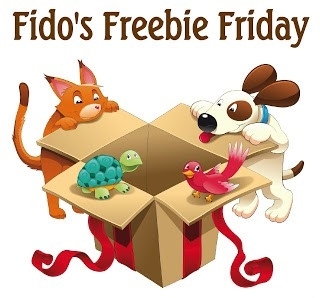 Fido's Freebie Friday Blog Hop is open to posts with prizes for pet products or services, including pet-related or pet-themed items for owners. Link up using your specific post url to make it easier to find. Please include our badge or a link to your post in your giveaway write up, and ask your readers to tell us who sent them. Your hosts, All Things Dog Blog, Doggies and Stuff and Dogtipper, and To Dog With Love appreciate our links in your posts. 3. How do I put the Fido's Freebie Friday blog hop badge into my post or on my site? 4. Can you help me sign up for the blog hop? All you need is the link to your specific giveaway post that you wish to list. You will find this URL link in the URL link bar at the top of your computer when you click the title of your post. Now visit either Doggies and Stuff, All Things Dog Blog or Dogtipper or To Dog with Love to locate our Fido's Freebie Friday post. You'll recognize it because it will have the badge inside of it. You can see the same badge that you can see at the top of this page in the sidebar. Now, scroll to the bottom of the post and look for the "Click here to enter" link. You will find a string of thumbnail images forming. This is the Blog Hop already chugging along. Click the link that says "Click here to enter". You'll be prompted to enter (a) your link for your post, (b) a caption for a photo, (c) your email and name. Next you'll be asked if you want to use a photo from your hard drive or the Internet (pictures from your blog). If you choose Internet, you can select the best photo from your post. A closeup profile-style picture works best for the linky list. This means a vertical photo, not horizontal. After you click on the photo of your choice, you'll get a cropping tool to adjust the visible area of your picture. Simply move the cropping tool to allow the best visible area. Click "done" when you're finished and your post will be entered into the linky list. Hit return to go back to the post and get the code at the bottom of the linky list. It says "Get code here". 5. How do I make the links show up on my blog? Go back to question # 4 and follow these instructions. 6. Why does the hop open on Thursday afternoon, if it is called a Friday blog hop? In an effort to make it easy for bloggers to participate, even if they work long days, we're opening the hop on Thursday afternoon to allow these folks to link up on Thursday evening, making their giveaways visible to all of our Fido's Freebie Friday Blog Hop traffic. The new week's Fido's Freebie Friday Blog Hop will open each Thursday afternoon by 4 PM. Your links may be added to your pet related giveaways with a link directly to your giveaway post at your blog. If you have listed a giveaway at the previous week's Fido's Freebie Friday that is still open to entries, you may wish to link up again each week to assure your event is seen by all of our visitors. This can be done any time after 4 PM ET each Thursday. 8. What can you tell me about the legalities of running giveaways? We recommend you do your homework on the FTC guidelines, as well as the recently modified rules regarding running your giveaways through Facebook. Take care to protect yourself from problems down the road by making sure you know what you’re getting into and you follow the rules set by government and any applications that you use to promote your event. Likewise, if you become aware of any issues that we need to attend to, we'd appreciate the courtesy of a private email to alert us. You may reach Carrie, Doreen or Paris at the email addresses in the sidebar. Another reminder that bears mention is that plagiarism is a crime. Bloggers work hard to write their content and it should never be copied. No matter how much you like XYZ Blog's review, you must write your own evaluation of every product you review. Photos are another issue to consider. Taking your own pictures of products you review will leave you in the clear. If you choose to use the manufacturer's or vendor's images, be sure to ask permission first. Generally they are willing to allow this for a product review, but it's always best to get this clearance in writing. Once you've determined your photo route, be sure to acknowledge the owner of all photos. Some photo collections require only a notice on each page of a website, while most would prefer a © notification immediately above or beneath the photo or the article. The more obvious and easy to locate, the less likely you are to encounter a problem. From time to time, there may be information or news about Fido's Freebie Friday. If we feel the need to contact you, or want to simply notify you of changes, we may do so with your email address or Twitter handle (privately) if we have access to it. Please know that we, in no way, mean to spam you. If you prefer not to receive any updates on the Fido's Freebie Friday events, please send an email to Carrie, Doreen, and Paris, specifying that you are opting out of communications regarding the Fido's Freebie Friday Blog Hop. Our email addresses are in the sidebar. If you make this decision, we encourage you to watch your Twitter stream for any notification of change to the event. We use the hashtag #FidosFreebieFriday to mention and locate Tweets regarding this weekly promotional event. Doreen, Paris and I thank you for your participation, and hope you find it brings added traffic and is a fun addition for your readers. If you’re new to reviewing products, you may find it useful to read some review posts on a number of different sites. This will help you understand the differences between various blog niches and how they analyze a product. You’ll want to create a formula for presenting your review that works with your particular blog’s niche, content and readers. This will help you maintain these readers, while offering them additional, valuable information and an opportunity to win free products if they’d like to participate in your giveaway. It's a Win-Win as long as you find your way--both legally and artistically. Enjoy your journey. ←Need some tips on your photography for posting your reviews? Check the sidebar.